Authorship: What and How and Why is it so Important to Google? Lately we are spotting all kinds of small developments pointing towards more importance for the authorship markup in Google. We’ve recently spotted Google E-mailing Authors about their Authorship Markups, Google showing authorship markup even when it’s not properly implemented and Google bringing back author stats in webmaster tools. Apparently authorship is important to Google. But why? 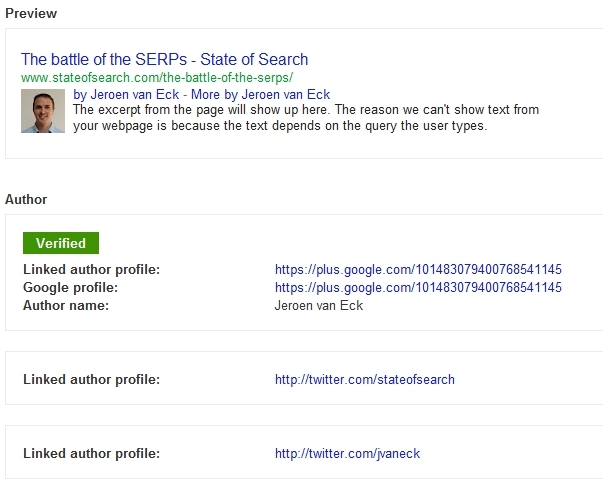 It’s a way for Google to show within the search results who’s the author of the content on a specific page. The result shows a headshot of the author, a link to his Google+ profile, the number of Google+ circles the author is in and a link to more search results for this author. How do you claim authorship over your content? Check that you have an email address (for example, [email protected]) on the same domain as your content (wired.com). Apparently Google has been picking up on authorship in instances where neither of these two methods are implemented correctly though, but one thing is always required: your Google+ profile. If you want to check whether you’ve implemented your authorship mark-up correctly you can use Google’s Structured Data Testing Tool. In this tool you can see Google is indeed picking up on more than just your verified author profiles. What can authorship markup do for you? When you login to Google webmaster tools with your Google account associated with your Google+ profile you can see search statistics for all the pages on any website for which you are the verified author. It’ll show you which pages are shown in the search results, how many times, how many clicks they received, which CTR the result has and the average position. As for the regular search stats within webmaster tools, Google also includes image search within the author stats. Which is odd because there’s no authorship included in image search results. Image search has a large impact on impressions, average positions and CTR. If you want to see better data you can filter for only web results. Sadly the author stats do not show average data about CTR and positions, but 1,300 clicks from 40,000 impressions with average positions all over the first page, doesn’t seem bad to me. The most important benefit for you as an author is of course visibility within the search results, which contributes to your branding. But for webmasters the most important benefit should be a higher CTR, hence more visitors. Since the introduction of the authorship markup there are different sites claiming a higher CTR since implementing (and optimizing) the authorship markup (here, here and here). But higher CTRs are just a temporary benefit for early adopters. The more sites and authors implement the authorship markup the less distinguishing the sheer presence of the authorship markup is. In march Searchmetrics already reported search results with authorship for 17% of the search queries. As soon as authorship markup is a common practice the impact on CTR will flatten. So what will be the potential benefit in the long run? AuthorRank is what Google is really after (along with pushing Google+ of course). In the long run Google needs a way to guarantee quality. Along with the Google Penguin update targeting spam algorithmically, Google also needed a reliable signal to predict quality of new content. And what’s more reliable than the historic quality of the author? Authorship is an ideal way for Google to force quality. When results with authorship get a ranking benefit in the SERPs, publisher will be more or less forced to use authorship. And when they do Google can easily come up with algorithms to determine authorship based on average shares, on-site activity, incoming links, authority on Google+. Exactly which factors will play a role will be hard to guess and will be subject to change by Google for improving the quality of AuthorRank. How to use authorship strategically? So, I guess there’s no escaping authorship. Well, that depends. If it’s content your target audience wants, which they probably do, than you have to get going with authorship. Ask yourself who should represent your brand related to your content. Is it your CEO? Is it your representative to your clients? Or is it your expert? It all depends on who you’re focusing on and which content your publishing. If it’s professional content, use your expert. If it’s about the strategy of your company, use your CEO. How cool is it that the story of Dell pops up the authorship markup of Michael Dell himself? As you can see the key in increasing the benefits of authorship lies in usage of Google+ and thinking cross-platform, increasing interactions with other sites and authors. This cross-platform publishing and active connecting is a great way for Google to get more data on who’s authoritative in which areas and most of all who’s left out of all these connections and therefore probably doesn’t represent high quality. Just remember these signals are guesses and will probably change as well based on the perceived quality of the signals by Google. Make sure your strategy is solid, so you don’t depend on these ‘tricks’. I just finished added micro data with schema.org to my Arizona fishing site for some of the lakes pages. I was checking it with the validation tool from Google and noticed the author was not specified. Some of the articles are composed by a few authors not just one. I was not sure you could set the author as an organization or not. I noticed on one page they picked up the author as “administrator” from the meta tag in my joomla template. I implemented Google authorship when it was launched. But till now it is not showing up. And I checked it even in the rich snippet tool at the time of implementation. It showed up there but not in search results. Same as Tom Creed, I want to know if I could set the author as an organization. In other words, link my article to a G+ Page, not to a G+ Profile. Is it possible? Hope somebody could anwswer. Thanx! Anyone else sees how pages and profiles are going to get seriously messed up with this? In my case, I run my websites as an individual. So should I link to my G+ Profile or the Page for my website? The problem is that authorship markup is focused on the personal profile. And it’s ranked based on how many circles I am, +1s the content receives, etc. And the rich snippet in SERPs shows the ‘in circles’ count for the personal profile. What if at my website I promote the G+ Page and encourage people to circle it instead of me. And if I’m not that socially active online, then me as author doesn’t have very high circle count, and hence limited ranking ability. Do you see the problem here? Google forces us to mix both personal and business identities. Obviously I want to share a lot of topic focused content with those who are interested of my page, but that’s not going to interest my personal friends. Or if I have write about 2 topics. Sharing info on two different topics just angers both groups of followers. Anyone has ideas on how to work through this? Hi Seppo, as Jeroen points out above there is also a ‘rel=publisher’ which for Google should fix that problem. I’ll try and write up something about that soon, or someone else on the site, to explain how that works and how to implement it! Pingback: How Will Author Rank Affect SEO Agencies? How can I use AuthorRank and/or my Google + profile to claim guest posts I write as my content? This article is extremely useful and has opened my eyes to the importance of Google+ and Google Authorship. As a blogger it’s no longer something I can avoid. I’ll admit, I was a huge fan of Authorship. I thought it was a great concept and I thoroughly enjoyed building it up while it existed. But what’s with Google killing off all of their products? It’s a real headache to us webmasters. It seems by the time we finally get used to something, they remove it. Appreciate the viewpoint though, great job!